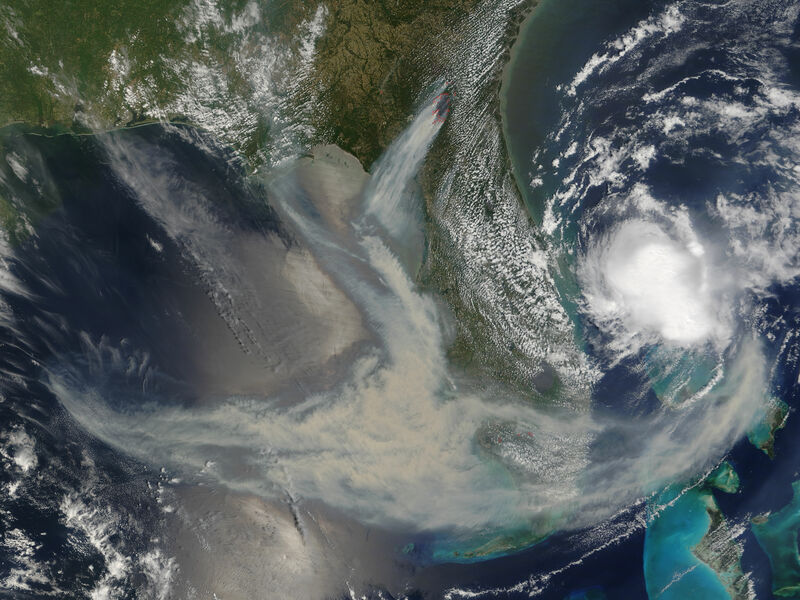 Subtropical Storm Andrea apparently did little to quench numerous large wildfires burning in the U.S. Southeast in early May 2007. 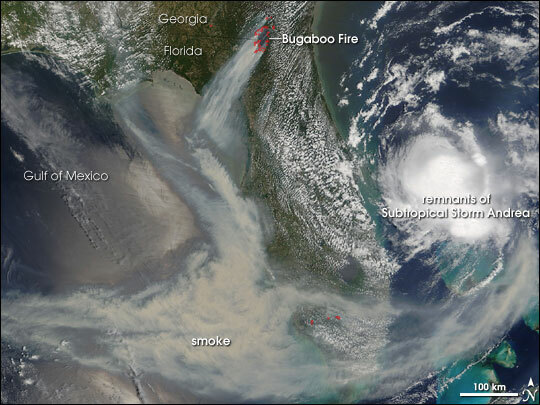 On May 11, 2007, when the Moderate Resolution Imaging Spectroradiometer (MODIS) on NASA’s Terra satellite captured this image, the remnants of the storm had dwindled to a small ball of clouds in the Atlantic Ocean, and huge plumes of smoke snaked across Georgia, Florida, and the Gulf of Mexico. Areas where MODIS detected actively burning fires are outlined in red. A huge fire is burning in and near the Okefenokee Swamp, which straddles the state line between Georgia and Florida. For logistical purposes, fire officials are calling the part of the fire in Florida the Florida Bugaboo Fire and the part in Georgia the Bugaboo Scrub Fire. The distinction is simply administrative, however; in reality, it is single, continuous swath of burning timber, swamp land, grass, and scrubland. The blaze was more than 133,000 thousand acres as of May 11, and it appeared to be spreading on virtually all perimeters at the time of the image, with active fire locations detected in a circle that surrounds an already burned (or partially burned) area. According to reports form the Southern Area Coordination Center, the fire grew by at least 20,000 acres on May 10. Numerous communities were threatened and hundreds of people were evacuated, while parts of Interstate 10 were closed to all but emergency vehicles. To the northeast of the Bugaboo Fire, other large wildfires were burning in Georgia as well. The Floyds Prairie Fire, to the immediate north, was threatening endangered species and their habitat, while farther north the 116,000-plus-acre Sweat Farm Road/Big Turnaround Complex Fire was still burning in the area south of the city of Waycross, nearly a month after the fires first started in mid-April. Southern Georgia and Florida are in the grip of moderate to extreme drought. The state line area where the Bugaboo Fire is burning is one of the areas in extreme drought. The extremely dry fuels, including easily flammable pine forests and plantations, and the rugged, isolated stretches of terrain, make fire officials think that these fires will continue to burn for a long time. Although extreme fire behavior may decline, smoldering and creeping fire will probably continue until heavy rain—possibly a hurricane—drenches the area. The large image provided above has a spatial resolution (level of detail) of 250 meters per pixel. The MODIS Rapid Response Team provides the image in additional resolutions. The group also provides twice-daily subset images of the United States in a variety of resolutions and formats, including and infrared-enhanced version that emphasizes the burn scars.